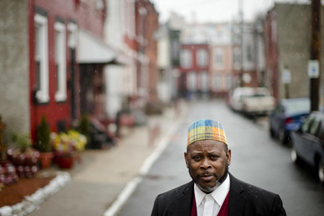 Mike Abdullah watched as a young woman lay shot in the street in a corner of north Philadelphia known as the Badlands, spitting up the blood that gradually choked her to death. The fatal shooting was one of many he says he has seen in the city over the years and felt helpless to stop. Recently, Abdullah — who also lost a younger brother and four nephews to gun violence — joined more than 50 of his neighbors at an elementary school to learn how to help the next victim in time. "He did what most young men do, tried to run to the hospital," Abdullah, 61, said of his brother. "He made it right up to the door and died because there was nobody to do these procedures on him." Temple University Hospital is enlisting neighborhood residents — most of them poor, black and living in violent areas — in the program, called "Fighting Chance." The doctors and nurses conducting the training have plenty of experience, as the hospital treats at least 400 shooting victims a year. The moments after a shooting are critical. A gunshot victim hit in the upper arm or thigh can bleed out in two minutes. Borrowing from battlefield tactics, the trainers teach neighborhood residents how to tighten a tourniquet around someone's arm, drag them to safety, apply pressure to major arteries to stop bleeding, and position victims in a vehicle before rushing them to a hospital. The program is part of a national campaign by the U.S. Department of Homeland Security called "Stop the Bleed," which recognizes that no matter how fast emergency responders get to a scene, bystanders will be there first. But most of the efforts elsewhere are aimed at teaching the public how to respond to mass shootings or mass accidents like a plane or train crash. Fighting Chance is run by volunteer hospital staff. Organizers are hoping to find funding to help pay for gunshot-treatment kits to distribute to people who have completed the program and to leave in places that could be adjacent to gun violence, from recreation centers to late-night takeout restaurants. At the recent training, grandmothers, uncles, young women and boys as young as 10 years old paid close attention as hospital volunteers demonstrated techniques before practicing on one another. Absent were young black men — the most likely group to be shot and killed. Homicide is the leading cause of death for black males between 18 and 34 years old in the U.S. and in Philadelphia. Police recorded more than 1,240 shootings across the city last year, including 690 involving young black men. Of those, 236 were fatal, and 51 percent of those killed were young black men. Scott Charles, Trauma Outreach Coordinator at Temple University Hospital and one of the program's organizers, suggested part of the challenge could be a mutual wariness between the young men and some in the community who fear them. "The guys who are sometimes engaged in the kinds of activities that put them in harm's way are sometimes reluctant to interact with folks that they see as being people who would tell on them," Charles said. "We have to be creative in how we get to them, because they need to be here." Marquita Harrington, a 32-year-old mother of two who attended a recent class, also noted black men her age are not part of the conversation. "We need to make them feel like a person and start letting them know we do care about them and that we don't think they're a nuisance," she said. In Fairhill, the neighborhood where the most recent class was taught, there have been 730 shootings since 2011. The approach might seem surreal but is a logical response to daily reality, Abdullah said. "This shouldn't be, that we're learning war zone tactics to save lives," Abdullah, 61, said. "This has been the best answer so far to save our children. The better solution is to get them jobs and education." The mood was enthusiastic, reflecting residents' investment in the training and a sense of urgency, said Ricardo Rose, who lived in the neighborhood as a child and moved back three years ago. "Everybody wants to talk about the lead crisis in Flint," Rose said, referring to the Michigan city where lead has tainted drinking water for months. "There's lead poisoning happening here, too."